Hercules Brewing Company existed back in the 1800’s, when there were 13 breweries in Belfast. This was at a time when Belfast was the biggest exporting port on the island and indeed the second biggest in the British Isles. The onset of the industrial revolution however, meant that the Guinness Family were able to invest ahead of the curve and as a result, the powerhouse of brewing became centered in Dublin and the 13 breweries in Belfast disappeared. 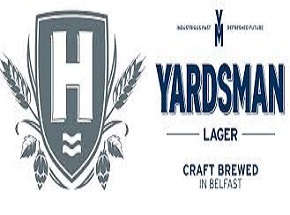 Niall McMullan decided to resurrect this Brewing Company and with it, some of the old traditions of brewing to create a small batch brew lager called Yardsman. Yardsman Craft Lager is a delicate beer with a mild floral hop character. It is filtered through Irish linen and matured for 6 weeks to allow the beer to mature and develop its smooth and full bodied character. Its delicate and easy drinking style, which is a perfect combination for food, belies its 4.8% ABV. Hercules has also created an original Belfast Pale Ale. This recipe is reflective of the beer style that would have been available in Belfast back in the mid-1800’s. It has a soft delicate floral bouquet with rich caramels. It has a fruity front palate with a dry full bodied citrus finish.